Why did we stop talking about all the people left off the insurance rolls? 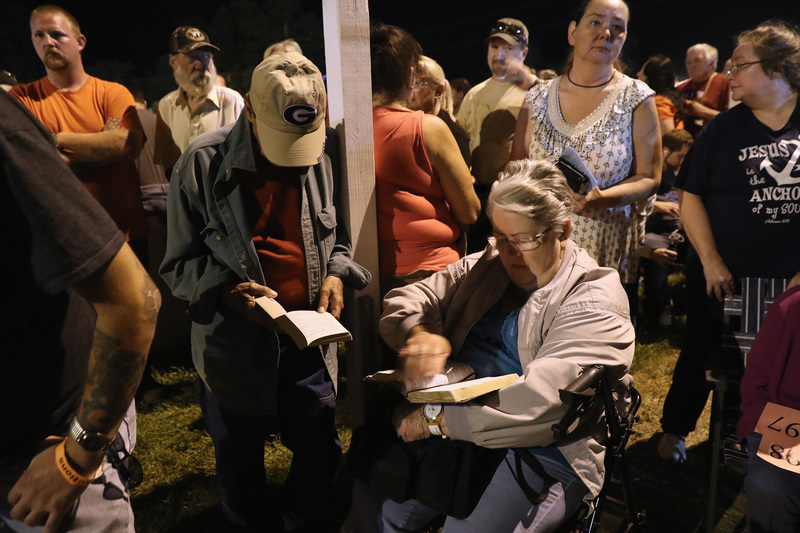 People read the bible while waiting to get free health care services at a mobile clinic in Wise, Virginia. Of the zillions of words written about the Affordable Care Act, relatively few in recent months have called attention to the people left out. Are the media no longer interested in those overlooked by the health care law? Or do segments of the American electorate mistakenly believe that the ACA and its Medicaid expansion cover everyone? Not long ago, I read through a Listserv exchange about the goal of the ACA’s health coverage expansion. Amid the back and forth about the preferred solution, one person said, “Universal coverage is the ACA — the ability to buy a plan.” In other words, she thought, the Affordable Care Act gave all people the ability to buy a plan regardless of their health status. The implication: was that perhaps there wasn’t much left to do; the problem had already been solved. As the country hurtles toward the general election next year, the main issue up for debate could well be health insurance. As Vox founder Ezra Klein tweeted, health care is “becoming a defining debate in the 2020 primary.” I agree, and at the root of that debate is the question we all keep wrestling with: Does every American have a right to health care and the insurance that makes it possible? The Affordable Care Act has not delivered us to that kind of health insurance nirvana. Despite widespread confusion on this point, it was never meant to cover everyone. It was always known that millions of Americans would be left in the cold. When the law passed, the Congressional Budget Office estimated that some 23 million people would remain without health insurance by 2019, down from 50 million in 2010. In 2013, before the ACA took effect, some 44 million Americans were uninsured. The number dropped to 27 million in 2016 but is again rising. Today almost 28 million are uninsured and the number is likely to increase, thanks largely to actions by the Trump administration that have begun to tear apart the law. But one group has been left outside the insurance umbrella from the beginning: those stuck in the so-called family glitch. The glitch stems from a provision of the ACA that prohibits family members from receiving Obamacare subsidies to buy insurance if family breadwinners have employer-provided insurance for which they pay less than 9.86 percent of their family income on premiums — for insuring only one family member. (That percent increases each year for inflation.) Under the law and its IRS interpretation, their single-person insurance is considered “affordable,” and they don’t need subsidies to help them out. But just because the government and the law say those breadwinners have “affordable” coverage for themselves doesn’t necessarily mean they can afford family coverage, which is considerably more expensive. If the employer doesn’t contribute to that coverage or contributes very little, which is often the case, insurance for the family may be out of reach. For several years I chronicled an Illinois family who was devastated by the family glitch. The Urban Institute estimates that there are now more than 6 million families affected by this “glitch.” They are not eligible for subsidies to buy insurance, and without them, it’s a good bet many are uninsured. Another large group fall in the so-called coverage gap — people with low incomes who are not eligible for Medicaid because their states refused to expand the program. The gap is a cruel artifact of the political fight over the ACA. Recall that the Supreme Court gave states the option of expanding Medicaid or not when it ruled on the law’s constitutionality in 2012, and to this day 14 states have not expanded their programs. Medicaid eligibility was supposed to extend to poor people with incomes up to 138 percent of the federal poverty level — $28,676 for a family of three in 2018. The Affordable Care Act has not delivered us to health insurance nirvana. Despite widespread confusion on this point, it was never meant to cover everyone. It was always known that millions of Americans would be left in the cold. The health law also assumed that premium subsidies to cut the cost of insurance would not be necessary for those under 138 percent of the poverty level since that group would be eligible for Medicaid. As a result, more than two million people find themselves in the coverage gap without any affordable options. Without Medicaid and without subsidies, they are too poor to buy insurance on their own. “They do not have an affordable coverage option available to them,” says MaryBeth Musumeci, a Medicaid expert at the Kaiser Family Foundation. To make lack of coverage even worse, seven states have enacted work rules with onerous requirements that could mean more people will be uninsured, while another eight states are currently seeking to add work requirements. One could be forgiven for concluding some states are trying to take insurance away from their residents by imposing stringent rules and administrative hassles. In Arkansas, some 18,000 have lost coverage from September through December for not complying with difficult requirements. If someone doesn’t comply, the state forbids them from reapplying for coverage until the following January. Imagine being locked out of something as important as health care because you didn’t understand a complicated rule or couldn’t reach some state bureaucrat. What will it take to bring those millions of people caught in glitches, gaps and islands into the insurance system? The U.S. has so far resisted that rather helpful and humane notion of a shared fate, but that may be slowly changing if the last election is any clue — at least when it comes to health insurance. Veteran health care journalist Trudy Lieberman is a contributing editor at the Center for Health Journalism Digital and a regular contributor to the Remaking Health Care blog.